Home Costs > How Much Does a Perc Test Cost? How Much Does a Perc Test Cost? A percolation test, often referred to as a “perc” or “perk” test is a type of test that is performed to determine the absorption rate of the soil. This test is required in virtually every city for those who want to install a septic tank and will determine the suitability of soil. Suitable soil is the key to providing an adequate on-site sewage system since it will determine whether or not the soil is capable of removing bacteria. 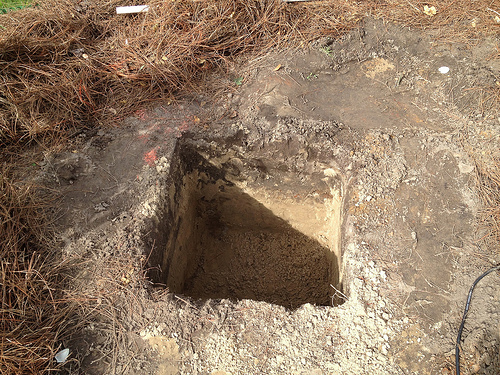 How much does a percolation test cost? On average, a percolation test can cost anywhere from $400 to as much as $1,500. This price will all depend on the amount of work being done, who you plan on hiring and the geographical location. Local laws will dictate who you’re going to hire. In areas where you need a backhoe operator and an engineer, it can be $150 to $500 for the engineer and another $300 to $550 for the backhoe operator. Since some situations can call for heavier equipment, surveyors and engineers, the costs can be much more than you think since it’s more than simply digging a hole and pouring in water. According to retipster.com, the costs will come down to the Health Department requirements, the location of the property, the plans you have for the site and the composition of the soil. Someone on Angie’s List answered this particular question and had said the costs will really depend on the soil type. For instance, a shallow rock and clay soil will probably cost more, but on average, he said most prices will be in the $500 to $1,000, but if the area requires a “deep hole,” then this can cost as much as $2,000 when you factor in the backhoe operator. When the procedure begins, a hole will be dug deep enough, usually five to 10 feet deep, so that water can be poured, and once these holes are dug, water will be filled in different intervals. Using a special tool, the water will be measured at a per-minute rate to determine if the soil is absorbent enough for a septic system. Once the test has been completed, the inspector will give out either a passing or failing grade. To pass, the perc rate will have to be less than 15 minutes per inch, and anything greater than 105 minutes per inch will be unacceptable. This test will be necessary by most local health departments as a mean to determine if your property is suitable for a septic tank. Most jobs will take about four hours, two of which will be for backhoe time. Depending on the local laws, the job will either have to be performed by a licensed professional or it may have to be performed by a local government employee who works for the local county Health Department. Experts are going to recommend that these tests are done during the wet season since it will be easier to dig through the soil. If you’re ready to order a perc test, call your local Health Department to see what the requirements will be in order to conduct one. In some cities, the department will perform all of the work, while other cities may require you to hire a licensed excavator to do the digging ahead of time. Failing a perc test doesn’t mean the end of the world. Ask the Health Department if there are any records on file for the property you’re having tested. In some cases, according to retipster.com, the source we mentioned earlier, there may be parts of the property that may pass with flying colors. Ask if you can repeal the results in the case of a failure, and if so, what are the circumstances? See if the soil drainage rate can have an influence on the failure rate. For example, the water in some geographical areas can higher in some seasons, whereas it can lower during others. Some areas will have specific requirements, only testing during the wetter season, while others allow you to test at any time. Unsure if you can pass the test? Pay close attention to the area surrounding you. For example, if there are homes nearby, then that means they probably passed the test. The same could be said about a higher elevated lot since lots higher in elevation can pass the test more often than, say, a piece of land on the bottom of a hill. Failed perc test alternatives are available if you still want to build on the property. For instance, you can spend more money on an engineered system and/or even add a raised sand bed system to overcome the property’s drainage issue. Keep in mind, however, if you go this route, you will pay two to four times the amount of the typical septic tank system. Don’t settle on the first inspector you find; instead, try to get at least three quotes. HomeAdvisor.com, for example, can help you connected with licensed and insured individuals in your area. Simply describe your job and they will contact you will estimates.